Waking up on Christmas to a mountain of colorfully wrapped gifts under the Christmas tree isn’t always the reality for some children, but the fifth-grade students at St. Patrick Catholic School in Arroyo Grande are trying to change that. Camille Zumbro teaches fifth grade at the school, and her class was given a project to create a farmers’ market to raise money for purchasing gifts for children in need. St. Joseph’s Roman Catholic Church provided the names of the children. 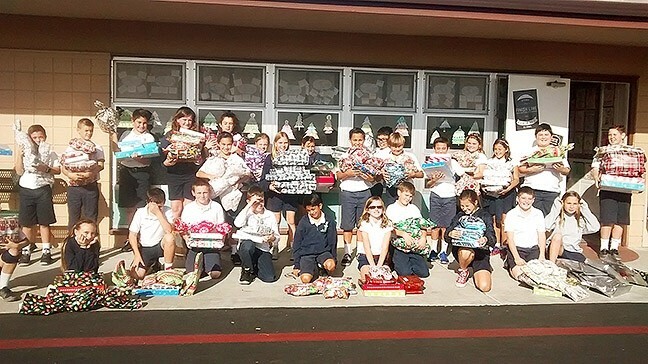 GIFTING: Camille Zumbro’s fifth-grade class from St. Patrick Catholic School in Arroyo Grande enjoyed purchasing gifts with their hard-earned money to spread Christmas cheer. Zumbro said the fundraiser project is a tradition for the fifth-grade class to take on. “The idea is it’s student driven; they’re responsible for every aspect of it, and they’re responsible from the beginning, such as coming up with the produce and figuring out what produce companies they want to contact,” she told New Times. And the class did just that. Zumbro said the kids thought of family members and people from the community who had ties with produce farms or businesses that could donate fruits and vegetables to their cause. After receiving the produce, students made signs, fliers, and really spread the word about their open market that took place Nov. 17 and 18. For those that wouldn’t be able to attend the market, students gave them order forms to fill out and hand-delivered the produce. Between the market and home deliveries, the class raised a little more than $2,000, which is about $200 more than what last year’s farmers’ market raised. Students were then given a $20 shopping budget to buy their assigned child a jacket and toy. The fifth-graders were able to buy gifts for more than 120 children in need. The amount of money that was raised by the farmers’ market surprised Carson Baldwin. The fifth-grader said she thinks they raised more money than last year’s class because they had more produce to sell and kept the market running for longer hours. The project was something she enjoyed working on mostly because she wanted to give another child the feeling of joy she experiences on Christmas when opening gifts. This sentiment is something that Zumbro said she talked to her class about before getting started with the project. She wanted her class to focus on the fact that not every child spends the holidays the same way and many aren’t as fortunate as they are. For Mason Sutherland, another fifth-grader in Zumbro’s class, the idea that others might not be as excited as he is on Christmas morning made him think. Steve Alesh is a partner at Beachside Produce, a company that has always been a supporter of the school as well as the fundraiser in the past. Alesh said that the company donates to the cause because it believes in helping students understand the importance of working together to share with others. “It’s just a good learning process to recognize there are a lot of different people in the community and there is something we can all do to help each other,” Alesh told New Times. Morro Bay Museum of Natural History is hosting events to highlight animals in nature each afternoon at 2 p.m. Dec. 27 through Jan. 7. The event is free to children; State Park Road in Morro Bay.